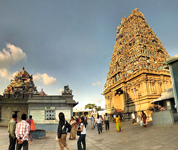 Chennai is not your average metropolitan town with a flashy lifestyle and modern structures. Rather, Chennai is more about temples, churches and just enjoying a quiet walk alongside the Marina beach. From the Parthasarthy Temple, which dates back to the 8th century, to the Basilica of San Thome, Chennai has loads to offer in terms of architecture as well as religion. What Chennai also offers is a cultural experience that is drastically different from that of other parts of India. You have to experience it to enjoy the laidback and often chaotic lifestyle that Chennai offers you. For those who are planning a trip to the capital city of Tamil Nadu, we have something to make their trip an even bigger delight. We have with us special offers on flights to and from the region, great discounts on rail tickets, special offers on hotels, fantastic tour packages for Chennai and a whole lot more. We even give you the option of online mobile recharge and let you pay bills online, for those who are looking for an extended stay in the city. Explore us to get to know deals on flights, hotels and a lot more in Chennai. We have amazing discounts waiting just for you.